The Civil Rights Act of 1964 was one of the most important civil rights laws in the history of the United States. It outlawed discrimination, ended racial segregation, and protected the voting rights of minorities and women. The Declaration of Independence declared that "All men are created equal." However, when the country was first formed this quote didn't apply to everyone, only to wealthy white landowners. Over time, things did improve. The slaves were set free after the Civil War and both women and non-white people were given the right to vote with the 15th and the 19th amendments. Despite these changes, however, there were still people who were being denied their basic civil rights. Jim Crow laws in the south allowed for racial segregation and discrimination based on gender, race, and religion was legal. Throughout the 1950s and early 1960s leaders such as Martin Luther King, Jr. fought for the civil rights of all people. Events such as the March on Washington, the Montgomery Bus Boycott, and the Birmingham Campaign brought these issues to the forefront of American politics. A new law was needed to protect the civil rights of all people. On June 11, 1963 President John F. Kennedy gave a speech calling for a civil rights law that would give "all Americans the right to be served in facilities that are open to the public" and would offer "greater protection for the right to vote." President Kennedy began to work with Congress to create a new civil rights bill. However, Kennedy was assassinated on November 22, 1963 and President Lyndon Johnson took over. President Johnson also wanted a new civil rights bill to be passed. He made the bill one of his top priorities. 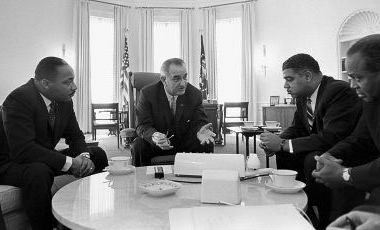 After working the bill through the House and the Senate, President Johnson signed the bill into law on July 2, 1964. The law was divided up into 11 sections called titles. Title I - The voting requirements must be the same for all people. Title II - Outlawed discrimination in all public places such as hotels, restaurants, and theatres. Title III - Access to public facilities could not be denied based on race, religion, or national origin. Title IV - Required that public schools no longer be segregated. Title V - Gave more powers to the Civil Rights Commission. Title VI - Outlawed discrimination by government agencies. Title VII - Outlawed discrimination by employers based on race, gender, religion, or national origin. Title VIII - Required that voter data and registration information be provided to the government. Title IX - Allowed civil rights lawsuits to be moved from local courts to federal courts. Title X - Established the Community Relations Service. 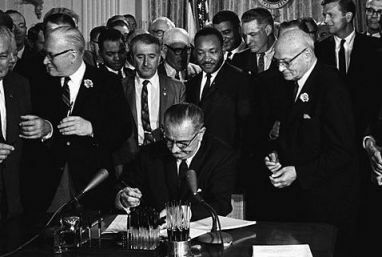 A year after the Civil Rights Act was signed into law, another law called the Voting Rights Act of 1965 was passed. This law was meant to insure that the right to vote was not denied any person "on account of race or color." A higher percentage of republicans (80%) in the House voted in favor of the law than democrats (63%). Same thing occurred in the Senate where 82% of republicans voted in favor versus 69% of democrats. The Equal Pay Act of 1963 said that men and women should be paid the same money for doing the same job. Southern democrats were staunchly against the bill and filibustered for 83 days. Most voting requirements beyond age and citizenship were eliminated by the Voting Rights Act. Martin Luther King, Jr. attended the official signing-in of the law by President Johnson.